BFD’s Office of the Fire Marshal is currently conducting a citywide inspection program of all occupancies. This process will include assigning an Occupancy Vulnerability Assessment Profile (OVAP) score for all occupancies within the city. 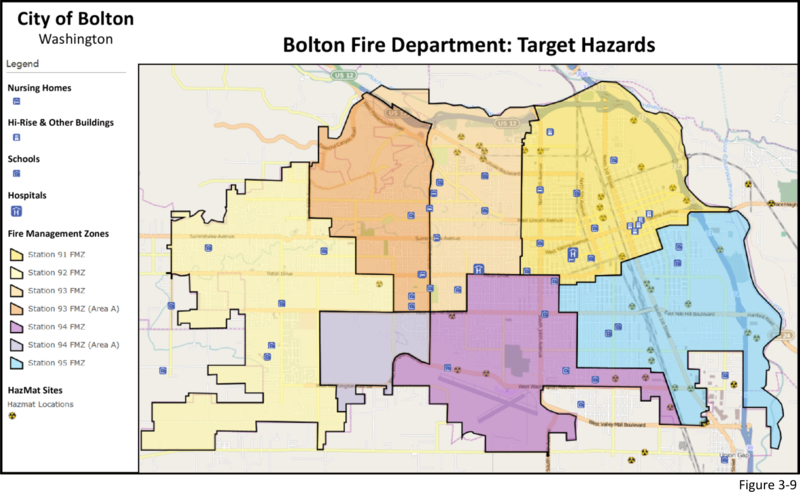 Data from this will enable a comprehensive GIS-based analysis and identification of the various target hazards located in Bolton. In the meantime, other major target hazards have been identified, as depicted in Figure 3-9. These include nursing homes, high-rise and other buildings (consisting of three floors or greater), all public schools, both hospitals, and locations of hazardous materials sites. This information will assist in determining where best to locate fire suppression and other specialty resources for each FMZ.